A new record has been set for the sale price of a house in Acton with a home in Perryn Road selling for £2,200,000. The house was already the most expensive property in W3 having previously sold for £1,700,000 in 2006. Another house in Rosemont Road has also recently sold for £1,525,000 making it the second most expensive property in the area according to the Land Registry. 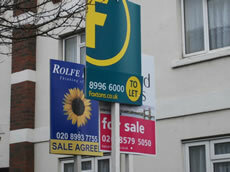 These sales have boosted the average price of a W3 home sold in the third quarter of the year to £436,857. This is a massive leap since the second quarter when the average was £339,418. If you exclude the two high priced properties referred to above from the figures the average falls to £394,301, still a substantial increase. If sustained this would represent a new all-time high for property prices in Acton. The previous highest quarterly average was £367,350 in the first quarter of 2008. Average prices in London as a whole were up by 0.9% in August according to the Land Registry, which brings them to £345,734. This is the sixth month in a row in which the capital's monthly movement has been greater than zero. Compared to August last year prices are up by 11.4% the strongest annual growth experienced by any region in England and Wales. The Land Registry's House Price Index for August was up by 0.3% the fifth month in a row in which the movement has been positive. This changes the average property value in England and Wales to £167,423. The annual house price change has now remained positive for ten consecutive months, with a movement of 6.7% in August.